It has been months since I last did a Stacking the Shleves post and if I put all the books that have crossed the threshold into my house and my Kindle since then, this would be the longest post that has ever appeared on Working for the Mandroid so far. 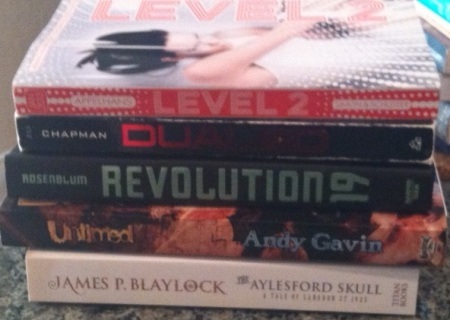 Instead, here are the books that have shown up in the last few weeks. Thanks so much to the Debut Author Blog Tour, Around the World ARC tour, Harper Teen, Andy Gavin and Titan Books. You can find my review of Revolution 19 here and look for my review of Dualed tomorrow and Level 2 on Thursday. Thanks to Amanda at Short and Sweet Reviews, I got a giant bag of books earlier this week that surprised me even though she'd emailed me about it! Since I don't read a lot of YA contemporary, some of these will find their way into my giveaway box, but I'm really excited about Why We Broke Up. I went a little mad with an Amazon order at the first of the year and last week I had a lovely box show up at my doorstep that made me giddy. And that's why my kitchen counter, coffee table and bedside table are overflowing with stacks of books right now. Next week will be the e-books that have appeared on my Kindle so far this year. What books have you gotten so far in 2013? Are there other people in your house who glare at you every time a new box shows up in the mailbox? Are the towers of books towering so high that they border on dangerous?